Arrrgh, mateys; this be one of my favorite weeks! If there's anything I know about a writer, I know we love to talk about our works. *Drinks from a bottle* What? You're saying this is rum? Oh, come now. I'm not old enough for that. 'Sides, I'm a pirate! *Places cat on shoulder* Don't chastise me, or you're walkin' the plank! Tickin' crocodile will be waiting. Ahh, okay. Here's a blurb about my dearest WIP titled FLAME DANCER. "The last thing Ashley Vaandere expects to do on her thirteenth birthday is look for her runaway brother. Then again, accidentally setting houses on fire wasn’t part of the plan either. The Vaanderes are not average siblings: they are best friends. Before long, Ashley runs away from home to find her beloved brother, terrified something could happen to him. Soon she realizes she can command the flames that wreak havoc wherever she goes, and befriends her gift. Ashley discovers her ancestor, who also controlled fire, participated in a war that has transcended time, death, and publicity. This war does not use guns and bombs—it uses the primary elements of lore. The war’s spoils? The world." And now that I have that, you guys are so priveleged as to see my first paragraph. (: Since the first is so short, I actually combined the first two. Don't hurt me. "Ashley made it into the alleyway unnoticed. That’s what she told herself. It was the missing poster’s fault. She wanted to compare how she and her brother looked a month ago. To look at their brown hair, her blue eyes, his green ones. For motivation." Wheeee! I love this WIP. Now I sail out in search of the writing treasures you've left for me eyes to behold. 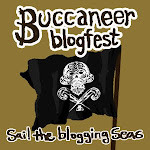 Happy sailing over the blogging seas! ***A Confession*** Does anyone else look up at the names they've come up with for their characters without help from the internet at all, and just suddenly think, "OMG, I'M THE BEST PERSON EVER. THIS NAME IS SOOO AWESOME!"? Yeah... I do that every now and then. ._. Oooooh...motivating her to do what?? I would read on! Lol, I'm sorry it's taken me this long to work my way to this port in the blog hop; you sound fun! That line about the war's spoils at the end of your blurb? A winner. Where does one put the stress in Vaandere (which, visually speaking, is a straight-up cool name)? Aww, thank you for checking it out! Yep, so true! It makes me sad to think that, lol. It's like almost all books are a combinations of parodies on different things. (: But we're all still awesome, so no worries!! This sounds like a really cool book. I love your first paragraph(s). The missing poster makes me want to know what the deal is right away. @Shell: Thank you so much! (: That was my goal. Awesome! Love the premise. Very cool. Nice to meet ya through the blogfest! Nice to meet you too! (: Thanks for stopping by! Hello, great to meet you! Cool premise. Thank you! (: Thanks for hosting the wonderful blogfest. Did the Linkytools blog list expire? Kendra, the best friends of brother and sister has me hooked. I LOVE that idea. So I am looking forward to hear more tomorrow! The bond between siblings is actually a recurring element in several of my books. (: There's just something about it that I like to write about!